Tielt (Belgium), 2009. Special limited edition: 2015. Gert Dooreman, born in 1958, is the most prominent graphic designer and typographer of his generation in Flanders (Dutch-speaking Belgium). He is also a brilliant illustrator, who quit illustrating for very personal reasons. I got to know Dooreman around 1987, shortly before I moved from Amsterdam to Gent, where Dooreman was based, working with photographers, theatre companies, and publishers. When major Belgian publisher Lannoo offered to publish a book covering his complete work, Dooreman decided to become his own editor. He invited friends, colleagues and specialized authors to cover aspects of his career. I was a bit of all three, and was assigned the honourable task of writing the introductory article, which summarizes Dooreman’s background and development, and tries to analyze his preferences and complex motives. It’s the only article in the book that was translated into English. 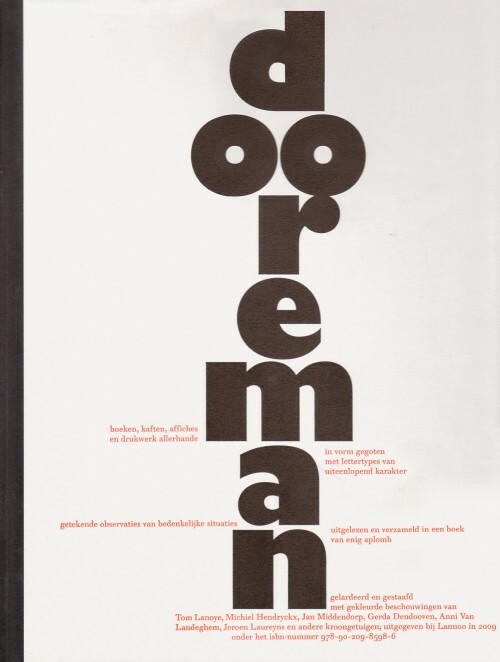 The book became quite successful, and in 2015, Dooreman produced an expanded edition, which was published in a luxury version.